This article is about a town in Australia. For the Australian photographer under the same name, see June Newton. For the racehorse, see Alice Springs (horse). Alice Springs (Eastern Arrernte: Mparntwe) is the third-largest town in the Northern Territory of Australia. Popularly known as "the Alice" or simply "Alice", Alice Springs is situated roughly in Australia's geographic centre. Alice Springs had an urban population of almost 24,000 at the 2016 Census; it accounts for approximately 10% of the population of the Northern Territory. It is nearly equidistant from Adelaide and Darwin. The town straddles the usually dry Todd River on the northern side of the MacDonnell Ranges. The surrounding region is known as Central Australia, or the Red Centre, an arid environment consisting of several different deserts. Temperatures in Alice Springs can vary dramatically, with an average maximum in summer of 35.6 °C (96.1 °F) and an average minimum in winter of 5.1 °C (41.2 °F). Alice Springs has faced many recent problems, largely stemming from a strong racial divide that has existed in the town for years, and an increase in crime. The Arrernte Aboriginal people have made their home in the Central Australian desert in and around the site of the future Alice Springs for thousands of years; evidence suggests Indigenous occupation of the region dating back at least 30,000 years. The Aboriginal name for Alice Springs is Mparntwe. Many Arrernte people also live in communities outside of Alice Springs and on outstations. It was not until alluvial gold was discovered at Arltunga, 100 kilometres (62 mi) east of the present Alice Springs, in 1887 that any significant European settlement occurred. The town's first substantial building was the Stuart Town Gaol in Parson's Street; this was built in 1909, when the town had a European population of fewer than 20 people. Many of the gaol's first prisoners were first-contact aboriginal men incarcerated for killing cattle. The first aircraft, piloted by Francis Stewart Briggs landed in 1921. Central Australia's first hospital, Adelaide House, was built in 1926 when the European population of the town was about 40. It was not until 1929, when the train line to Alice was built, that the town's European population began to grow. Aboriginal Centralians outnumbered European Centralians until the mid-1930s. From 1926 to 1931, Alice Springs was the seat of government for the now-defunct Territory of Central Australia. Until 31 August 1933, the town was officially known as Stuart. 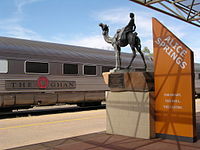 The original mode of British-Australian transportation in the outback were camel trains, operated by immigrants from Pathan tribes in the North-West Frontier of then-British India (present-day Pakistan); known locally as Afghan cameleers based at Hergott Springs, or Marree as it is now known. Many cameleers moved to Alice Springs in 1929 when the railway finally reached the town. They lived on the block where the town council is now, transporting goods from the rail head to stations and settlements to the north. A gold rush in Tennant Creek in 1932 kept the wheels of the Alice Springs economy turning until the outbreak of World War II. The number of soldiers posted in Alice Springs peaked at around 8,000 and the number of personnel passing through totalled close to 200,000. Once the war ended, the military camps and the evacuees departed, and Alice Springs' population declined rapidly. After being visited by nearly 200,000 people, including the American General Douglas MacArthur, Alice Springs gained considerable fame. The war years also left behind many structures. The historically-listed Totem Theatre, created for the entertainment of this camp, still exists today. The Australian Army set up the 109th Australian General Hospital at Alice Springs. Seven mile aerodrome was constructed by the Royal Australian Air Force. War-related operations necessitated the first sealing of the road between Alice Springs and Larrimah, expansion and improvement of Alice Springs' water supply, and improving the rail head. The war-related operations left behind thousands of pieces of excess military equipment and vehicles, and a marked increase in Alice Springs' population. During World War II, Alice Springs was the location of RAAF No.24 Inland Aircraft Fuel Depot (IAFD), completed on 20 May 1942 and closed in November 1944. Each usually consisting of four tanks, 31 fuel depots were built across Australia for the storage and supply of aircraft fuel for the RAAF and the US Army Air Forces, at a total cost of £900,000 ($1,800,000). Alice Springs has many historic buildings, including the Overland Telegraph Station, the Old Courthouse and Residency and the Hartley Street School. Adelaide House, a beautiful stone building in the middle of the Mall, Central Australia's first hospital, was designed and built by the Rev. John Flynn, founder of the world's first flying doctor service, in 1926. It was also the site of the world's first successful portable wireless radio experiment conducted by Alf Traeger. Today it is a museum, one of several significant tourist attractions which form part of 'The Flynn Trail' a self-guided urban heritage trail. Today, the town is an important tourist hub and service centre for the surrounding area. It is a well-appointed town for its size, with several large hotels, a world-class convention centre, and a good range of visitor attractions, restaurants, and other services. The region around Alice Springs is part of the Central Ranges xeric scrub area of dry scrubby grassland and includes the MacDonnell Ranges which run east and west of the town and contain a number of hiking trails and swimming holes such as Ormiston Gorge, Ormiston Gorge Creek, Red Bank Gorge and Glen Helen Gorge. The 223-kilometre-long (139 mi) Larapinta Trail follows the West MacDonnell Ranges and is considered among the world's great walking experiences. The Simpson Desert, southeast of Alice Springs is one of Australia's great wilderness areas containing giant, red sand dunes and interesting rock formations such as Chambers Pillar and Rainbow Valley. Under the Köppen climate classification, Alice Springs has a Hot desert climate (BWh), featuring extremely hot, dry summers and mild winters. Located just south of the Tropic of Capricorn, the town of Alice Springs straddles the usually dry Todd River on the northern side of the MacDonnell Ranges. Alice Springs is located in Central Australia, also called the Red Centre, an arid environment consisting of several different deserts. The annual average rainfall is 285.9 millimetres (11.3 in) which would make it a semi-arid climate except that its high evapotranspiration, or its aridity, makes it a desert climate. Annual precipitation is erratic, varying year to year in Alice Springs. In 2001 741 millimetres (29.2 in) fell and in 2002 only 198 millimetres (7.8 in) fell. The highest daily rainfall is 204.8 millimetres (8.06 in), recorded on 31 March 1988. Temperatures in Alice Springs vary widely, and rainfall can vary quite dramatically from year to year. In summer, the average maximum temperature is in the mid-30s, whereas in winter the average minimum temperature can be 5.5 °C (41.9 °F), with an average of 12.4 nights below freezing every year, providing frost. The elevation of the town is about 545 metres (1,788 feet), which contributes to the cool nights in winter. The highest temperature on record is 45.6 °C (114.1 °F) first recorded on 29 December 2018, while the record low is −7.5 °C (18.5 °F), recorded on 17 July 1976. This is also the lowest temperature recorded in the Northern Territory. 64.2% of people were born in Australia. The next most common countries of birth were New Zealand 3.6%, United States of America 2.8%, India 2.8%, England 2.6% and Philippines 2.1%. 68.3% of people only spoke English at home. Other languages spoken at home included Malayalam 1.7%, Arrernte 1.0%, Tagalog 1.0%, Mandarin 0.8% and Filipino 0.8%. Other than English, the most common languages spoken in Alice Springs are: Arrernte, Warlpiri, Luritja, Pitjantjatjara, and Italian. Americans have lived in Alice Springs continuously since the establishment of the United States Air Force Detachment 421, in 1954. Currently located on Schwarz Crescent, it is part of a joint American–Australian project called the Joint Geological and Geographical Research Station (JGGRS). The unit is locally known as "Det 421" or "The Det" and has sponsored as many as 25 American families to live as temporary residents of the Alice Springs district. To mark the longstanding friendship with the community, on 1 July 1995, the Alice Springs Town Council granted Detachment 421 freedom of entry to the Alice Springs. Since the early 1970s, the majority of the American population in Alice Springs has been associated with proximity to Pine Gap, a joint Australian-US satellite tracking station, located 19 kilometres (12 mi) south-west of Alice Springs, that employs about 700 Americans and Australians. Currently, 2,000 residents of the Alice Springs district hold American citizenship. Many of these, joined by some Australians, celebrate major American public holidays, including the 4th of July and Thanksgiving. Americans in Alice Springs are also known to participate in a variety of associations and sporting teams, including baseball, basketball and soccer competitions. Alice Springs began as a service town to the pastoral industry that first came to the region. The introduction of the rail line increased its economy. Today the town services a region of 546,046 square kilometres (210,830 sq mi) and a regional population of 38,749. The region includes a number of mining and pastoral communities, the Joint Defence Space Research Facility at Pine Gap and tourist attractions at Uluru-Kata Tjuta National Park, Watarrka National Park and the MacDonnell Ranges. The largest employer in Alice Springs is the Northern Territory Government, with 8% of employed people working in government administration, 7% in school education, and 4% in the Alice Springs Hospital. The economy of Alice Springs is somewhat reliant on domestic and international tourism, with 4% of its workforce employed providing accommodation. Property crime is a significant social issue in Alice Springs, and violent crime in the town in 2010 was at unprecedented levels and "out of control". Alice Springs has been described as one of the most dangerous towns in Australia and as the murder capital of Australia. The level of crime has had a major impact on the town's tourist industry with tourists from several countries being warned to avoid the town or take extra precautions. Most violent crime in Alice Springs is between Aboriginal people, with violence directed at non-Aboriginal people infrequently. The high crime rate is due to conditions in Alice Springs Aboriginal communities. The Aboriginal town camps of Alice Springs are notorious for their drinking, violence and substandard conditions. Assaults are common in Aboriginal town camps and 95 percent of people in the town fleeing domestic violence are indigenous. The level of domestic violence in Aboriginal communities has been described as "out of control" by the Northern Territory Coroner. The Indigenous camps of Alice Springs were described by the Minister for Indigenous Affairs as "murder capitals". Crime rates in Alice Springs Aboriginal communities reached crisis point in 2013, leading to the local government called an emergency meeting of Territory government, police and other stakeholders. The over-representation of Aboriginal people is also attributable in part to Aboriginal people moving into Alice Springs from more remote communities. Youth crime is a serious problem in Alice Springs, especially at night when large numbers of youths wander the streets of the town unsupervised, committing assaults and burglaries, vandalising property and throwing rocks at moving vehicles. The youth crime problem is attributed to Indigenous people coming to town from remote communities to escape the NT Intervention, with some children using government funded public transport to travel hundreds of kilometres from remote communities to Alice springs unaccompanied. Local MP Chansey Paech objected to this as unfairly blaming children from remote areas, noting that a large proportion of problem youth are from Alice Springs. The youth crime problem in Alice Springs is also attributed to children roaming at night to avoid abuse and domestic violence at home. Youths throwing rocks at cars travelling the streets in Alice is an ongoing problem with many vehicles damaged and several people seriously injured. Emergency services workers, including police and ambulance have also been the target of rock attacks by youths. The TV series Pine Gap (2018) is set around the Australian and American joint defence intelligence facility at Pine Gap, located near Alice Springs. Ian Moss released a song called "Such a Beautiful Thing" on the 1988 album Matchbook, which contains the lyrics 'thinking back to Alice Springs'. He has stated that he wrote the song as a tribute to the Northern Territory. Alice Springs has a high rate of participation in many different sports, including tennis, hockey, Australian rules football, basketball, baseball, soccer, cricket, rugby and boxing. Every year, on the Queen's Birthday long weekend, the annual Finke Desert Race is held. It is a gruelling off-road race that runs from Alice Springs to the Finke community, then back again the next day. The total length of the race is roughly 500 kilometres (310 mi). It attracts spectators, who camp along the whole length of the track, and roughly 500 competitors, buggies and bikes, every year, making it the biggest sporting event in the Alice Springs calendar. ^ a b c Australian Bureau of Statistics (27 June 2017). "Alice Springs (Urban Centre)". 2016 Census QuickStats. Retrieved 18 December 2017. ^ "2011 Census Community Profiles: Alice Springs". ABS Census. Australian Bureau of Statistics. Archived from the original on 1 December 2017. Retrieved 15 September 2016. ^ Geoscience Australia Centre of Australia, States and Territories updated July 2006 Archived 12 February 2014 at the Wayback Machine "Officially, there is no centre of Australia. This is because there are many complex but equally valid methods that can determine possible centres of a large, irregularly shaped area especially one that is curved by the earth's surface." See the Geoscience Australia page for further details. ^ "Climate statistics for Alice Springs Airport". Bureau of Meteorology. 2011. Archived from the original on 2 June 2011. Retrieved 19 June 2011. ^ "Crime wave brings racial divide to Alice". The Australian. 23 February 2011. Archived from the original on 22 June 2016. Retrieved 17 March 2015. ^ Thorley, Peter (2004). "Rock-art and the archaeological record of Indigenous settlement in Central Australia". Australian Aboriginal Studies (1). Archived from the original on 23 August 2014. Retrieved 18 June 2011. ^ a b c Brooks, David (2003). A town like Mparntwe: a guide to the dreaming tracks and sites of Alice Springs. Alice Springs: Jukurrpa Books. ISBN 1-86465-045-1. Archived from the original on 1 June 2011. Retrieved 18 June 2011. ^ Stuart, John McDouall (1865). Explorations in Australia. London: Saunders, Otley, and Co. p. 1. Archived from the original on 17 March 2019. Retrieved 25 January 2019. ^ Stanton, Jenny (2000). The Australian Geographic Book of the Red Centre. Terrey Hills, New South Wales: Australian Geographic. p. 75. ISBN 978-1-86276-013-4. ^ State Library of South Australia, "De Havilland D.H.4 flown by Francis Briggs after landing in Central Australia", State Library of South Australia. Retrieved 16 June 2014. 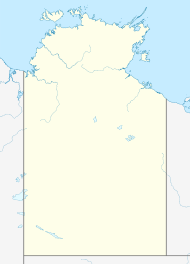 ^ "Northern Territory (Administration) Act 1931". Commonwealth of Australia. Archived from the original on 3 December 2018. Retrieved 22 December 2018. ^ "About Alice Springs – History". Alicesprings.nt.gov.au. 31 August 1933. Archived from the original on 24 May 2011. Retrieved 30 May 2011. ^ a b "Central Australia the war years 1939–1945". RSL On-Line Museum. RSL Sub Branch Alice Springs. Archived from the original on 17 February 2011. Retrieved 8 August 2011. ^ "Alice Springs (Mparntwe) NT". Flinders Range Research. Flinders Ranges Research. Archived from the original on 16 July 2011. Retrieved 8 August 2011. ^ "The Ghan – Outback experiences – Northern Territory Official Travel Site". Travelnt.com. Archived from the original on 27 September 2007. Retrieved 30 May 2011. ^ World Wildlife Fund, ed. (2001). "Central Ranges xeric scrub". WildWorld Ecoregion Profile. National Geographic Society. Archived from the original on 8 March 2010. Retrieved 30 May 2011. ^ Linacre, Edward; Geerts, Bart (1997). Climates and Weather Explained. London: Routledge. p. 379. ISBN 978-0-415-12519-2. Archived from the original on 24 June 2016. Retrieved 21 September 2016. ^ McKnight & Hess, pp. 212–1, "Climate Zones and Types: Dry Climates (Zone B)"
^ "Weatherbase: Records and Averages for Alice Springs, Northern Territory, Australia". Weatherbase. Archived from the original on 29 July 2013. Retrieved 30 May 2011. ^ "Climate statistics for Australian locations". 8 December 2016. Archived from the original on 20 June 2008. Retrieved 22 June 2008. ^ a b c "3218.0–Regional Population Growth, Australia, 2014-15:ESTIMATED RESIDENT POPULATION – Greater Capital City Statistical Areas (GCCSAs)". Australian Bureau of Statistics. Australian Bureau of Statistics. Archived from the original on 1 October 2016. Retrieved 28 September 2016. Estimated resident population, 30 June 2015. ^ "2006 Census Tables : Alice Springs (T) (Local Government Area)". Australian Bureau of Statistics. Retrieved 18 June 2011. ^ a b c d e Australian Bureau of Statistics (25 October 2007). "Alice Springs (T) (Local Government Area)". 2006 Census QuickStats. Retrieved 14 January 2009. ^ "2006 Census QuickStats: Northern Territory". Australian Bureau of Statistics. 25 October 2007. Retrieved 19 June 2011. ^ Foster, Denise; Michell, Julia; Ulrik, Jane; Williams, Raelene (2003). "Population and Mobility in the Town Camps of Alice Springs: A report prepared by Tangentyere Council Research Unit" (PDF). Tangentyere Council, Alice Springs. Archived (PDF) from the original on 16 February 2011. Retrieved 16 June 2010. ^ "Alice Springs – Aboriginal Culture". Alice Springs Town Council. 8 June 2006. Archived from the original on 18 December 2006. Retrieved 25 November 2006. ^ "Seventh Council 1992-1996". www.alicesprings.nt.gov.au. Alice Springs Council. 18 March 2014. Archived from the original on 23 June 2017. Retrieved 13 June 2017. ^ Great Southern Railway (May 2006). "Submission to the Productivity Commission: Road and Rail Freight Infrastructure Pricing" (PDF). Productivity Commission. Australian Government. Retrieved 20 April 2019. ^ a b "censusdata.abs.gov.au/ABSNavigation/prenav/ViewData?action…". archive.is. 27 November 2012. Archived from the original on 27 November 2012. ^ Adlam, Nigel (31 December 2008). "DAILY TELEGRAPH, Outed: Lesbian capital of Australia". News.com.au. Archived from the original on 5 September 2012. Retrieved 30 May 2011. ^ Inc., Finke Desert Race. "About Us - Contact, Business, Media, Membership, Sponsors, Volunteers - Tatts Finke Desert Race". finkedesertrace.com.au. Archived from the original on 2 August 2017. Retrieved 4 August 2017. ^ "General Information". Clean Enery Council. Archived from the original on 1 September 2010. Retrieved 7 August 2010. ^ "Nocookies". The Australian. Archived from the original on 23 August 2014. Retrieved 12 June 2015. ^ a b "Nocookies". The Australian. Archived from the original on 23 April 2011. Retrieved 19 February 2011. ^ "Alice crime rates reach unprecedented levels". ABC News. Archived from the original on 22 December 2015. Retrieved 12 June 2015. ^ "Nocookies". The Australian. Archived from the original on 30 September 2014. Retrieved 12 June 2015. ^ "Welcome to Australia's most dangerous town". Archived from the original on 18 March 2018. Retrieved 4 August 2017. ^ a b "Foreign travellers warned about visiting Alice Springs". 15 March 2017. Archived from the original on 28 July 2017. Retrieved 4 August 2017. ^ a b c d "Alice Springs Crime". 24 July 2017. Retrieved 4 August 2017. ^ Webb, Carolyn (15 March 2017). "Foreign tourists warned on Alice Springs safety risks". Archived from the original on 31 July 2017. Retrieved 4 August 2017 – via The Sydney Morning Herald. ^ ""Big problems" in Alice Springs - Inside Story". 25 February 2011. Archived from the original on 28 July 2017. Retrieved 4 August 2017. ^ "Northern Territory Safe Streets Audit". Archived from the original on 12 June 2015. Retrieved 12 June 2015. ^ a b "7.30 –ABC". Archived from the original on 13 July 2015. Retrieved 12 June 2015. ^ a b "7.30 ABC". Archived from the original on 13 July 2015. Retrieved 12 June 2015. ^ ""Big problems" in Alice Springs • Inside Story". Archived from the original on 14 June 2015. Retrieved 12 June 2015. ^ Skelton, Russell (26 May 2011). "No town like Alice". Archived from the original on 31 July 2017. Retrieved 4 August 2017 – via The Sydney Morning Herald. ^ "Domestic violence 'out of control in NT Aboriginal communities'". 21 September 2016. Archived from the original on 17 July 2017. Retrieved 4 August 2017. ^ "Walkout sinks town camp safety summit hopes". ABC News. Archived from the original on 13 July 2015. Retrieved 12 June 2015. ^ "Get off Facebook and help us, NT Police tell Alice Springs residents". ABC News. Archived from the original on 11 June 2015. Retrieved 12 June 2015. ^ a b c "Destroyed in Alice". 18 February 2011. Archived from the original on 12 May 2017. Retrieved 4 August 2017. ^ "Troubled youth need help, not hate". Archived from the original on 1 November 2017. Retrieved 28 July 2017. ^ "Rock-throwing youths in Alice Springs will be taken into child protection: Giles". 16 April 2015. Archived from the original on 2 June 2017. Retrieved 4 August 2017. ^ a b "Ambulance struck in rock attack". Archived from the original on 6 February 2017. Retrieved 28 July 2017. ^ "Alice Springs woman attacked by rock throwers". Archived from the original on 28 July 2017. Retrieved 4 August 2017. ^ a b "Rock throwing film calls on kids to make the right choices — Relationships Australia - Northern Territory". www.nt.relationships.org.au. Archived from the original on 5 August 2017. Retrieved 4 August 2017. ^ a b "Rocks thrown at police, windows broken, vehicles damaged in Alice Springs". 14 April 2015. Archived from the original on 8 February 2017. Retrieved 4 August 2017. ^ "Burning fuel hits crowd at Australia event". 4 September 2017. Archived from the original on 3 August 2018. Retrieved 20 July 2018 – via www.bbc.co.uk. ^ "Acquiring a Bike Permit". Arunga Park Speedway –Motorbikes. Archived from the original on 26 September 2013. Retrieved 26 September 2013. ^ "Centralian Advocate". National Library of Australia. Centralian Advocate. ^ Australian Railmaps, "RAIL MAP – PERTH to ADELAIDE, CENTRAL AND NORTHERN AUSTRALIA" Archived 24 September 2016 at the Wayback Machine. Retrieved 12 June 2007. ^ "Alice Springs Airport". Archived from the original on 16 May 2015. Retrieved 4 June 2015. ^ "Alice Springs – Sister city media release". Alice Springs Town Council. 9 August 2005. Archived from the original on 20 August 2006. Retrieved 5 July 2007. Wikimedia Commons has media related to Alice Springs. Wikivoyage has a travel guide for Alice Springs. (Link to TV transmission frequencies list from ACMA website).